Mini pigs are cute, but large pigs, well that's a different story. Large pigs have tusks, are territorial and defecate large amounts, none of which are qualities of a cute pet. Unfortunately for many Vietnamese people in recent times, their once cute mini pigs have grown to be 100kg plus monstrosities in less than a year, only fit for the abattoir. Recently, the social networks have been abuzz with the story of Ngô Hoài Yên, a girl living in the southern province of Bình Dương. 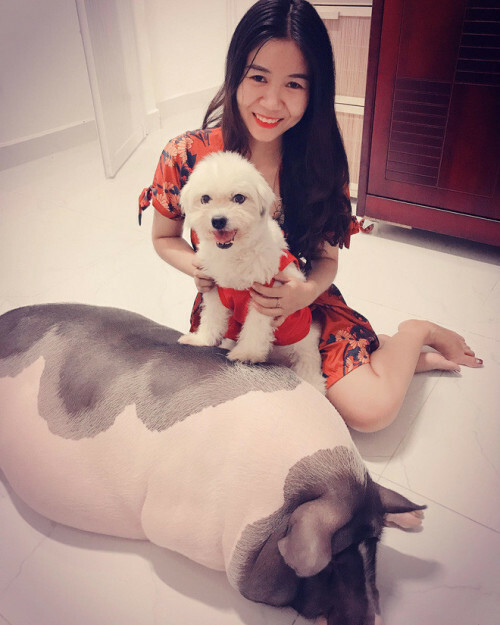 She believed an online salesman's assurance that the 2kg mini pig would always be cute and petite. Hoài Yên bought the mini pig but a year later, the pig was more than 100kg in weight. Yên wanted a cute companion, but now she's stuck with an animal that makes living in her own house inconvenient. The girl wrote the floor was slippery and the animal eats late at night or early in the morning and "screams for food."